So your got you new iPhone and are loving the app store. Buy your apps and tapping away. What could make this experience even more enjoyable? How about getting you apps at a discount or even free. 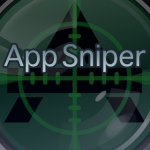 App Sniper and it’s back end server are a tool that presents you with a list of discounted and new applications available in the iTunes app store. Making a purchase is very simple. Press the “Buy” Button and yo’ll be transfered to the “App Sotre” on your iphone, where you can complete your purchase. To get hold of your copy, go to the on-phone app store and search for ” App Sniper”.